Reading the paper this morning and came across this very interesting article. The announcement was made as DfT figures showed that more than one in six local roads in England was in need of repair. Seventeen per cent of unclassified roads — the majority of roads intended for local traffic, including residential streets and country lanes — “should have been considered for repair” in the year to the end of March 2018. It was the same as a year earlier. 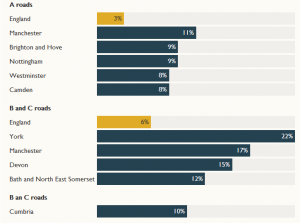 Three per cent of local A-roads were in a poor state. The proportion increased to 11 per cent in Manchester and 9 per cent in Brighton and Nottingham. In Buckinghamshire kinetic energy recovery technology will be used to gather energy from the carriageway and relay it to roadside battery units. This can then be used to power street lights. In trials in Bedfordshire geothermal energy will be used to heat water pipes laid just below the surface to help to de-ice car parks and bus stations. The pothole problem has been causing alarm. Recent research by the RAC indicated that more than 674,000 were reported in the past 12 months, a rise of 33 per cent in three years. 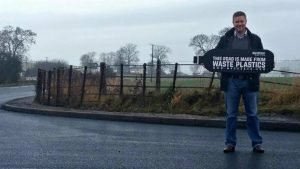 Critics claim that local roads have been left in a poor state because of years of underfunding as councils spend more on social care. In many areas, last year’s harsh winter led to already poor roads simply crumbling away. It resulted in rising numbers of accidents among cyclists and left thousands of cars with damaged shock absorbers, broken suspension springs and distorted wheels.